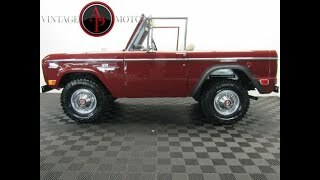 Hi, I am interested in your 1969 Ford Bronco (stock #AP246) listed on Autotrader for $49,900. I'd like to get more information about this vehicle and confirm its availability. CALL TODAY!704-230-1010MECHANICAL:-V8 302.-CRT performance ignition upgrade.-Three speed upgraded floor shifter from Tom Bronco parts.-Dual exhaust.-4x4.-Power brakes.INTERIOR:-Front bucket seats.-Original rear bench.-New dash pad.EXTERIOR:-Rotisserie restoration.-Beautiful base coat clear coat Dark Red paint.-Brand new soft top.-Restored half cab.-Factory steel wheels and hubcaps with brand new Mud Terrain tires.-All new chrome accents and bumpers.DISCLOSURES:-Truck was run as a half cab. We have installed the original back seat a little wear shown in pictures.-Wiper are not on the Bronco. They work perfectly. This truck has never seen the rain! The wiper arms come with it.CALL TODAY FOR QUESTIONS OR ADDITIONAL PICTURES! 704 230 1010RESTORATIONS:The term restoration in context to the vintage car world has taken on a definition of its own. For some people, a restoration is simply painting a car and replacing items as needed, while for others, restoration means an extensive disassembly and overhaul, with each piece getting rebuilt or replaced. We are not a restoration shop, verbiage used in descriptions in reference to variations of restoration are given to us by consignors/sellers of vehicles. Verification of the level of restoration is the responsibility of the buyer before purchase either in person or by third party inspection service.DEPOSITS:DEPOSITS TO PURCHASE VEHICLE/S IS $500, UPON PAYMENT OF THE $500 THE VEHICLE WILL BE HELD FOR 72 HOURS PENDING FINAL PAYMENT. DEPOSITS ARE NON-REFUNDABLE. INSPECTIONS AND OR PRE APPROVAL FOR FINANCING SHOULD BE PERFORMED PRIOR TO PUTTING A DEPOSIT DOWN ON A VEHICLE. INSPECTION OR DENIAL RESULTING IN NOT PURCHASING THE VEHICLE/S DOES NOT WARRANT REFUND OF DEPOSIT. A $299.00 DOCUMENT FEE WILL BE ADDED TO ALL SALES TO COVER COSTS OF CHARGES IMPOSED BY FEDERAL AND NORTH CAROLINA DMV. ALL SALES WILL HAVE A $299 ADMINISTRATION FEE.SHIPPING:VEHICLES HAVE 10 DAYS OF FREE STORAGE AFTER PAYMENT/DOCUMENTS ARE SUBMITTED. AFTER 10 DAYS A STORAGE FEE OF $100 PER DAY WILL BE IMPLEMENTED. WE ASSIST IN SHIPPING FOR ALL CLIENTS USING CENTRAL DISPATCH. IF MONEY OFFERED TO SHIP VEHICLE BY BUYER IS COMPARABLE TO GOING RATE SHIPPING WILL HAPPEN WITHIN THE 10 DAY ALLOTMENT.FINANCING:JJ BEST BANC. COLLECTOR CAR FINANCING800-872-1965$500 NON-REFUNDABLE DEPOSIT DUE TO PURCHASE THE VEHICLE. PAYMENT IS DUE IN FULL WITHIN 72 HOURS OF MAKING DEPOSIT OR DEPOSIT IS FORFEIT. DOWN PAYMENT REQUIRED BY LENDING INSTITUTION WILL BE DUE WITHIN 72 HOURS OF DEPOSIT IN ADDITION TO DEPOSIT.INSPECTIONS:PLEASE EITHER COME AND INSPECT YOUR VEHICLE OR HAVE IT INSPECTED BY A THIRD PARTY INSPECTOR BEFORE DEPOSIT OR PURCHASE. BUYING A VEHICLE IS LIKE PURCHASING A HOME. BOTH PARTIES ARE RESPONSIBLE FOR INSPECTION AND DILIGENCE. WE ARE BROKERS ON THESE VEHICLES AND DO OUR BEST TO INSPECT BUT YOU THE BUYER HAVE RESPONSIBILITY TOO. WE SUGGEST THIRD PARTY INSPECTIONS OR IN PERSON.SHIPPING:WE CAN SET UP THE SHIPPING FOR YOU. WE USE CENTRAL DISPATCH AND THEY ENSURE ALL CARRIERS ARE LICENSED, INSURED AND BONDED.INTERNATIONAL BUYERS:WE ARE MORE THAN HAPPY TO WORK WITH INTERNATIONAL BUYERS. WE CAN GET THE VEHICLE TO THE PORT YOU REQUEST FOR SHIPPING TO YOUR COUNTRY. PLEASE KNOW WE CANNOT SHIP IT TO YOU/YOUR COUNTRY, AS YOU WILL BE IMPORTING THE VEHICLE YOU WILL HAVE TO HANDLE THE INTERNATIONAL PORTION. WE WILL DO OUR BEST TO ASSIST!THE INFORMATION GIVEN IN THE DESCRIPTION ABOVE IS EITHER OUR OPINION, THE OPINION OF THE FORMER OWNER, OR BASED OFF OF VISUAL AIDS AND SHOULD NOT BE TAKEN AS FACT. IT IS YOUR RESPONSIBILITY AS THE BUYER TO CONFIRM OR DETERMINE SPECIFICS OF THE VEHICLE. PLEASE NOTE THAT WE DO NOT GUARANTEE ANY AIR CONDITIONING SYSTEMS, GAUGES, OR ELECTRICAL SYSTEMS. GIVEN THE NATURE OF THE VINTAGE VEHICLES WE SELL, THESE COMPONENTS CAN BE WORKING AT ONE MOMENT AND NOT WORKING AT ANOTHER MOMENT. IT IS COMMON THAT THESE COMPONENTS WILL NEED UPKEEP OR ATTENTION. IN ADDITION, MANY TIMES THESE VEHICLES SIT FOR LONG PERIODS OF TIME AND ONCE YOU BEGIN TO DRIVE THEM HARDENED SEAL AND GASKETS MAY BEGIN TO LEAK! CLASSIC CARS LEAK. PLEASE MAKE SURE YOU ARE COMFORTABLE WITH THIS BEFORE BUYING A VINTAGE AUTOMOBILETHE VEHICLE IS BEING SOLD AS IS WITH NO WARRANTIES OR REFUNDS AVAILABLE. THIS IS A USED VEHICLE BEING SOLD AS IS.